This the favorite British luxury leather products' brand. If you s elect Mulberry then you are a person who love classic values - their designs are based on traditional styles and shapes for men bags. The leather choice is quite exclusive, as this brand uses only the best leathers. All of the details will be manufactured and crafted perfectly. This brand is well known in Europe and is just starting to conquer the world. The company was started in 1971 in (Chilcompton) Great Britain. It sells clothing for women and men, shoes, exquisite leather handbags and other small leather products. Their logo is a tree. All of the Mulberry handbags are made in Great Britain or in Europe. This is also a socially responsible company and in 2006 they started local apprenticeship program aimed at improving skills and training of local workforce, especially youth. 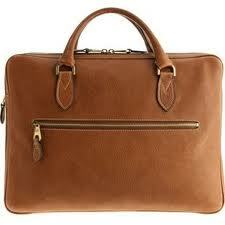 Mulberry is brand if you need an elegant leather briefcase as this brand offers plenty of men's briefcases. The current brand's collection has more than 40 different men's briefcases in several classic colors and various document cases. Each one is unique and carefully crafted. 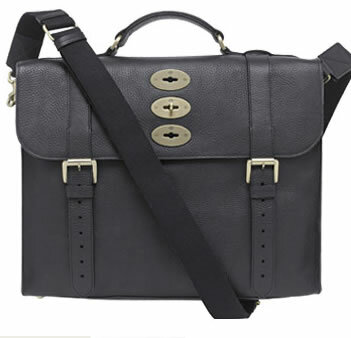 Mulberry briefcases can be also used as laptop bags, for example, the Tony Briefcase and Heathcliff briefcase has special pockets for laptops. The classic Mulberry Walter briefcase can also hold a laptop, however not the big one. The Elkington is another great Mulberry briefcase. There is also Oliver briefcase, Tristan briefcase and many, many more. If you are quite particular about what you need, then the briefcases and messenger's collection has the biggest selection of wonderful leather briefcases. If you need something ultimately versatile then there is the Ted messenger. The Ted messenger has the triple postman lock with additional straps for closure. It is made in blue shade calfskin and can be used for many purposes. Overall it is a decent daily handbag to carry a laptop or documents or any other daily essentials with you. As regards its price it is 970 EUR (USD = 1,395.00). This messenger has a single handle and an adjustable shoulder strap. The pocket is one slip pocket. The sizing for this multifunctional and convertible bag is 33 cm x 39 cm x 11.5 cm. In inches the same is 13" x 15.4" x 4.5". This messenger can be converted into backpack and carried cross body as well. Another success product of this brand are Mulberry messenger bags for men. The Byrnmore bag that can hold a MacBook, Dan messenger bag or the Mulberry Antony messenger bag they have nice color variety and the impeccable quality of this British brand. There are also gum bags and travel bags that have been made in the best traditions of this brand.